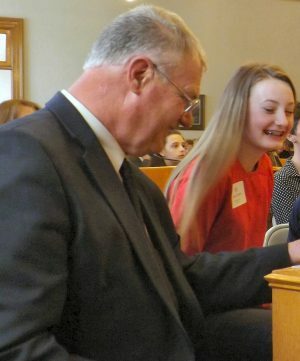 Legislator Richard Kline shares a laugh with his student, Alaina Hubbell. OSWEGO, NY – They came in as students. But, they left as teachers. About three dozen students took part Thursday in the annual County Government Day. Legislature Chairman Kevin Gardner, left, presides over the meeting with the help of his student, Joe Reed. At right is County Attorney Richard Mitchell. Paul A. Forestiere II, executive director of Oswego County’s Cornell Cooperative Extension, welcomed everyone to the legislature meeting. “This is a wonderful day every year; we absolutely love doing it and I know the legislators do, too,” he said. He said it was his favorite day of the year. The students, representing schools from all across the county, sat with the legislators and took an active role in the meeting. 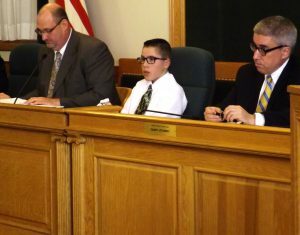 The students said they appreciated the chance to sit in on an actual county meeting and vote for their legislators. They had a busy day. Prior to the legislature meeting, they had toured the 911 Center. Retiring 911 Director Mike Allen has been a strong supporter of the students over the years, Forestiere said. “We are very appreciative that you took these students in, gave them the chance to see the inner workings of 911, to be able to sit down with a judge and ask them questions. These are all skills that these kids are going to take forward and use later on in their lives,” Forestiere said. They also conducted a mock debate. 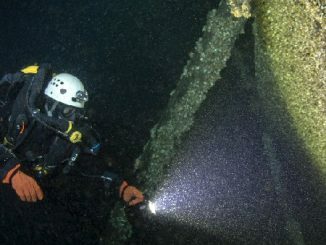 It regarded the immediate and intensive development of Lake Ontario oil fields within the boundaries of Oswego County. “The students were divided into three caucuses, the pros and cons and undecideds. They prepared very thoroughly. 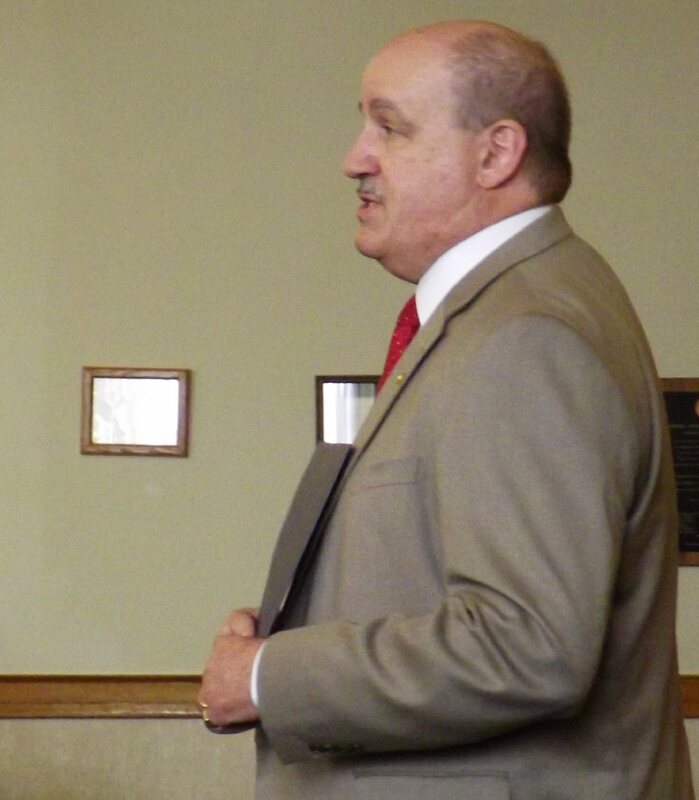 A very lively debate ensued and the conservationists triumphed,” said Legislator Jack Proud. Legislator Proud has facilitated this facet of Youth Day for 21 of his 22 years on the legislature. The undecideds listened and took into account what people said on both sides of the issue. The final results were 28 votes no and seven votes yes, Proud reported. Assisting the students were legislators Margaret Kastler and Heather DelConte on the pro side and legislators Tom Drumm and Terry Wilbur on the other side and Shawn Doyle who worked with Proud on the undecideds. Legislator John Proud introduces his student, Autumn Parkhurst. Kevin Gardner, chairman of the legislature, thanked the legislators for their work and the students for their participation. “You do a great job. This legislature sincerely appreciates what you do,” he said. Alaina Hubbell of Phoenix said she learned a lot from her legislator, Richard Kline. She said the program has sparked her interest in government. However, she added she still likes pursing a career in forensics better. Joseph DelConte said he found the debate on the mock resolution interesting. He was paired with someone he is very familiar with – his mother, Legislator Heather DelConte. He also thanked the legislators for coming to other Cooperative Extension programs. “You are there. You come to the programs, you want to be part of them,” he said. “We could not do this without you. 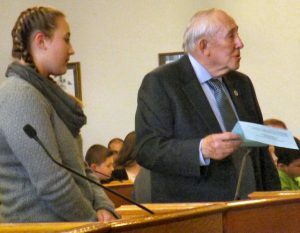 Oswego County Youth Government Day is a way to give young people an opportunity to learn first-hand about American government, he told Oswego County Today. “The reality is, you are looking at the next generation. And maybe by exposing them to what we have today, maybe we can get some of the young people to say, ‘yes, I would like to do that,’” he said. He thanked the county and his staff for all the hard work that went into making the day possible.